Israel’s Kadima party boss Shaul Mofaz says he will give the Muslims 100% of their territorial demands if he is elected Prime Minister. 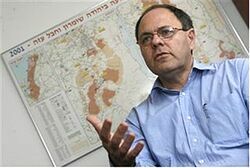 This guy Mofaz makes Tzipi Livni and Shelley Yakimovich actually seem like Israeli patriots. Actually, I will comment further and I don’t care anymore about remaining even remotely civil. Hey leftists: You want it so bad, then go for it. Really. Make nice-nice with pure evil. Give ’em whatever they want. One thing that you don’t or won’t think about though: You’re Jewish too. The peace lovers won’t give a damn that you helped them, or that you want to ‘coexist’, or anything else. You’re gonna get a round to the head or a sword through your neck just the same as anyone else who’s not one of them. Know why ? Because their main goal – all of them – as mandated in their so-called ‘religion of peace’ – is to kill every Jew on the planet and destroy Israel, then move on to the rest of the ‘western infidels’. One more thing leftists: When the S does HTF – and it’s coming – don’t get anywhere near trying to ask for help. You’re the enemy as well and will be treated as such. Go spit up a rope. This entry was posted on Saturday, April 7th, 2012 at 17:47 and is filed under Main Postings. You can follow any responses to this entry through the RSS 2.0 feed. You can leave a response, or trackback from your own site. 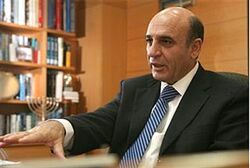 3 Responses to Israel’s Kadima party boss Shaul Mofaz says he will give the Muslims 100% of their territorial demands if he is elected Prime Minister. I think that is “Piss up a rope.” Do you know what happens to politicians when they take Viagra? They get taller. Is that a relative to Moshe Kenny?